This happens especially in the summer time. People email me or message me on Facebook pictures of their most recent take home from their food pantry or CSA share. The veg in question…bok choy. 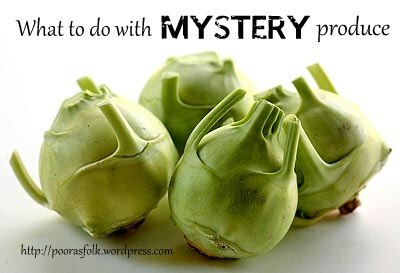 I once ended up with a whole box of rescued bok choy. I knew the feeling. Food pantry produce is obviously a blessing, especially since so many food banks have a limited resource of fresh produce or don’t even deal with produce at all. Quite a few pantries that I know of often can’t include produce because they have limited storage space and/or no refrigeration and also only have a distribution day once every 2 weeks. The negative side of food pantry produce is that sometimes what’s being handed out is the grocery stores surplus of veggies that haven’t sold well that week …meaning…the unpopular, often confusing ones. But it isn’t just the unpopular veg that throw some people off. My inbox is a confessional at times. People admit, embarrassed , that they’ve never eaten common things like broccoli or carrots before .Or that they’ve certainly eaten potatoes in their life but never cooked them. No need to be embarrassed here. I grew up in a household where everything was cooked from a box or was served out of a can. I had to teach myself about real food. There’s no shame in admitting that you don’t know something and asking to be informed, whether the subject is kale or world history. So, if you have food that comes your way, you can totally ask me. If I don’t know the answer, I can find someone who does. Every Friday on this blog and the Facebook page, I’ll have a weekly Frugal Foodie Friday. If you have a certain produce items or basic cooking skill you need tips how to master, ask away and on Fridays, I’ll post the info. There’s a few other great sites you can check out that might give you some ideas. The Farmers’ Market Recipe Generator is honestly quite limiting right now with the produce options input in to the generator but it’s still a good start. On buzzfeed, there’s a list of 31 Things To DO With Confusing CSA Veggies and nourished kitchen has another great list of some general ideas for what to do with those veggies in your CSA box.